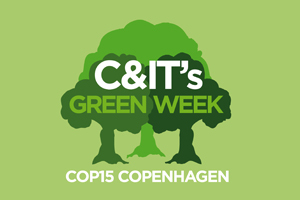 C&IT GREEN WEEK: A giant illuminated globe will be suspended above Copenhagen's city hall square, Radhuspladsen, today as part of Hopenhagen Live, a 12-day programme of science and cultural live experiences including music, films, speeches, debates and art. The event has been organised to coincide with COP 15, the UN Climate Change Conference which begins today. A number of companies, artists and organisations have been invited to take part and present the climate solutions of the future in an interactive fashion. From 7-18 December, the globe will display a rotating image of Earth, which is directly affected by people's actions, for example, when someone signs up for global climate campaigns through websites like www.hopenhagen.org, it will trigger a green marker on the globe and affect its surface and colour. People can also send messages via the internet or mobile phones, which will be projected onto the globe. Hopenhagen Live is part of the global campaign 'Hopenhagen', developed by the International Advertising Association (IAA) with the support of the UN.